A sophisticated Berkeley audience stood to applaud conductor Ming Luke, violinist Benjamin Beilman and the Berkeley Symphony last Thursday, Oct. 4, in a work that was as severely modern as it was technically jaw-dropping. That work, Jennifer Higdon’s Violin Concerto, won the Pulitzer Prize in 2010. Crafted of harmonics and fierce call-and-responses, the concerto’s architecture and virtuosity were as unexpected as they were challenging. In the first concert of their new season, guest conductor Luke was assured and incisive, and the Symphony followed his small sharp gestures with tight unisons and acrobatic runs. But that was the second work on the program. The evening opened with Shostakovich’s Festive Overture, a work whose big joyous sounds were unlike anything else he composed. Written one year after the death of Stalin, he was apparently celebrating a small breath of freedom behind the Iron Curtain. Full of bright ringing chords, huge brass sustains and acrobatic clarinet and flute runs, this was taken at a dizzying clip, and the rapport between Ming Luke and these musicians was abundantly clear. And that was expected, as Luke, in addition to his busy schedule on the road and with the SF Ballet, has led these musicians into the Berkeley Schools for years of outreach programs. Then 28-year-old violinist Beilman took the stage. Higdon workshopped her Violin Concerto while teaching composition at the Curtis Institute of Music, and that is where Beilman was exposed to it. Written for violinist Hilary Hahn, it began with tentative harmonics, and some may have wondered if Beilman was tuning up or if the concerto had already begun. Then triangle teased the smallest hairs in our inner ears, and the harmonics solidified into a motif. Beilman went rich and low, and Concertmaster Franklyn D’Antonio took over those high harmonics. They built a weave that glowed with color, and then the other instruments came in, some for texture and some in a sharp dance with the soloist. After that long first movement, English Horn gave sensual textures to a slow dance that treated Higdon’s signature odd intervals with sweet clarity. And then Beilman brought down the house with the acerbic and sharply rhythmic finale, a stuntman leading an orchestra of daredevils. There were long applause, and Beilman returned with a Bach encore of rich double stops and perfect trills, as certain and heart-soothing as the last was heady. Explosive and frenetic, this work was a long trip inside a brilliance that burned too hot. The string themes were anxious and repetitive, turning one’s attention sharply inward, while the lower brass added an undercurrent of dark fears. In the eye of this storm a piccolo sang an arpeggio, distracted and soaring, to better highlight the Light that beckoned Schubert. Tightly focused basses drove a galloping rhythm through the middle, and then the long tone poem gentled into death with thrums of gong and muted tuba. Disturbing and gorgeous! This contrast was perfectly realized by the musicians, with intimate harp runs and trombone harrumphs. Cellos lumbered into the waltz, and then violins shrieked the syncopated melody, a caricature of a graceful way of life before the killing fields. Conductor Joana Carneiro stepped down at the end of last year, and so this season will be led by four guest conductors, each of whom may be considered as the future Artistic Director. What a brilliant beginning for a search! 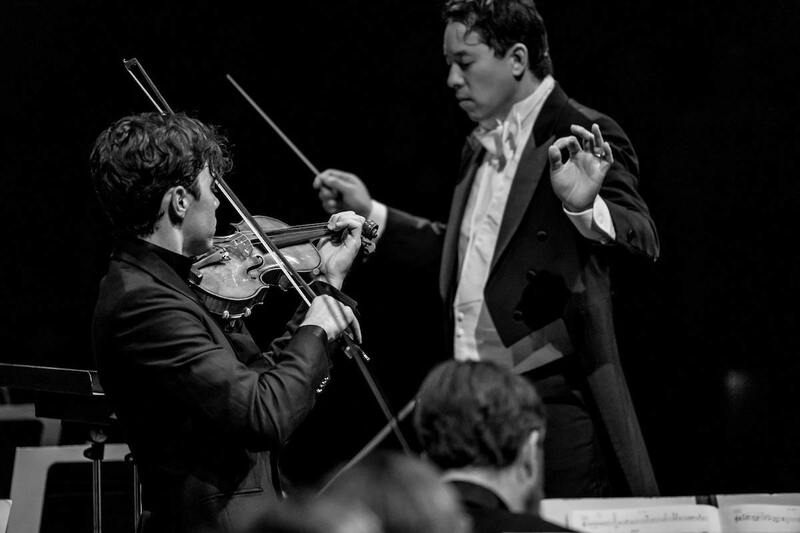 Photo top of violinist Benjamin Beilman and conductor Ming Luke, photo by Dr. David Weiland.